The NYS Financial Restructuring Board for Local Governments’ six-month time frame is up and the city of Fulton is waiting for the final report on what, if any, assistance is available for the financially strapped community. 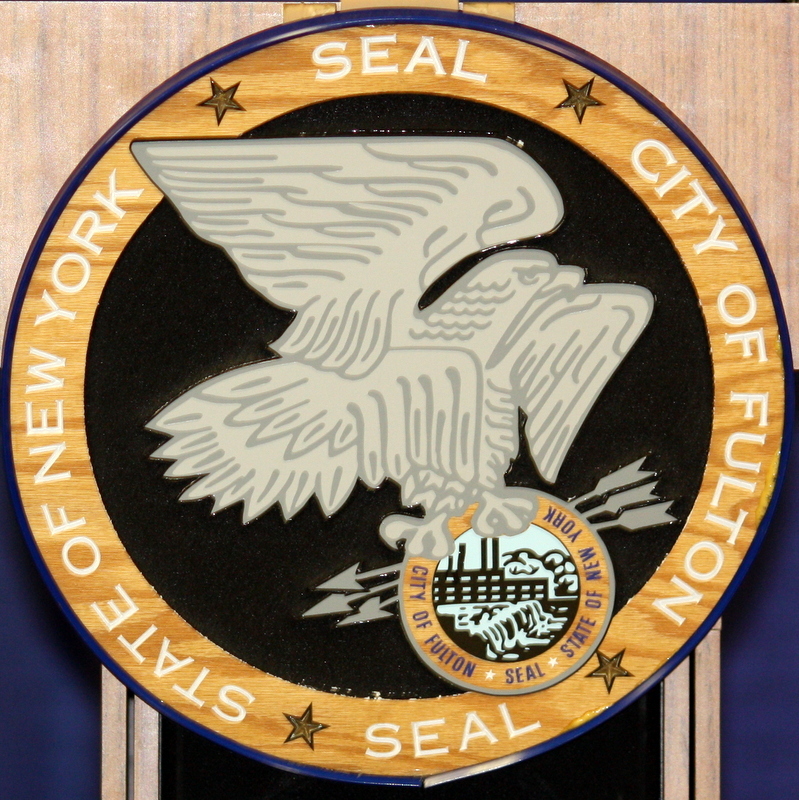 In November New York State’s financial restructuring board accepted the city of Fulton’s application as a municipality in need and after several meetings with staffers, county officials and city department heads a plan is in its final draft awaiting approval in Albany. 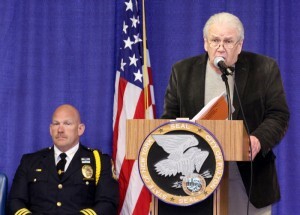 Fulton Police Chief Orlo Green listens as Mayor Ron Woodward welcomes the community to the annual police and fire department awards ceremony in April. While Mayor Ron Woodward was unable to share all of the details in the submitted draft report, he discussed with Oswego County Today one of the measures he hopes the city can use, if the need arises. “This is a section that was in the draft report that I hope is retained in the final report. It will certainly be used during negotiations,” he added. According to the draft document, in a binding arbitration situation the reform gives increased weight to an eligible local government’s ability to pay as well as requires arbitrators to consider the limitations of the property tax cap for these local governments. So, in effect, right now if an arbitrator makes an award to the unions that cost more money for the city to implement, it could result in cuts to other areas of city government and/or a rise in property taxes. The mayor said the way the state laws are written encourage arbitration boards to interpret the laws liberally in favor of the public unions and they are acting within the parameters of the law. 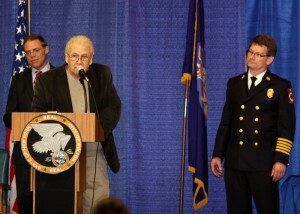 Mayor Ron Woodward addresses the crowd during the annual police and fire awards ceremony in April as Assemblyman Will Barclay, at left and Acting Fire Chief Paul Foster look on. If that happens, that’s when the financial restructuring board would take over the process for arbitration “if both sides agree,” he noted. “What you see in that legislation is, if it got that far, and the FRB was selected to arbitrate, then the arbitrator would have to consider the city’s ability to pay – which they never have,” Woodward said. “They do a great job, they’re very professional,” the mayor said, but he noted this is not about quality of service, it is about the ability of taxpayers to pay. As much as he respects the fire, police and laborers concerns as they have stated in the past about losing members and the future of their departments, “I’m concerned, too,” the mayor said. “However you can lose your home to a fire or you can lose it to the tax block, too. Either way you lose it and neither way is good,” Woodward said. The FRB was created last summer by Gov. Andrew Cuomo, with the purpose of analyzing and advising qualified local governments on improving fiscal stability, management and the delivery of public services. The board is empowered to provide awards of up to $5 million per municipality through the Local Government Performance Efficiency Program to eligible applicants. The board also is empowered to serve as an alternative arbitration panel for binding arbitration between municipalities and unions such as police and fire at no cost to either party. Even as Fulton waits for its plan, the state comptroller is seeking to expand ways a municipality can take advantage of the FRB. In April, Comptroller Thomas DiNapoli offered a proposal to empower the FRB with the ability to use grant money to reimburse local governments for costs incurred to develop multi-year budget plans. DiNapoli’s proposal would allow counties, cities, towns and villages identified as fiscally stressed to be reimbursed by the state’s FRB for all or part of the costs associated with long-term budget planning. The proposal was forwarded to the Local Government committee and has not yet been placed on its agenda for discussion. There is no question about it, big adjustments to the police, fire and municipal employees will be required if the city is to survive, either with or without the FRB assistance. Woodward and his cronies have been playing “kick the can” down the road for too long and now they are out begging in the streets. The residents need to speak up, enough of this being the highest taxed city in New York.